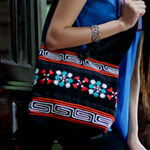 Working with cotton, the Lanna artisans handcraft this cotton shoulder bag. The body features labyrinthine and floral motifs stitched by hand. 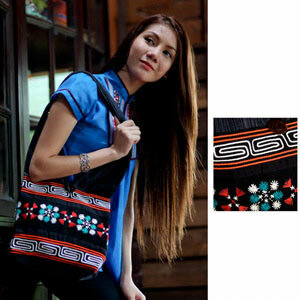 Thin gold cords and rain tree wood beads decorate the strap; and the bag fastens with a hoop over an elephant button carved from coconut shell. Lined with cotton, it features one inner pocket.